9. 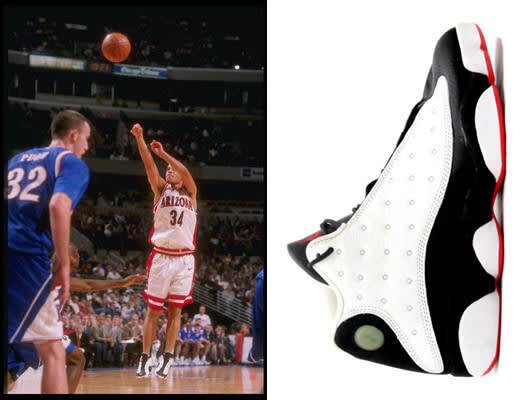 Air Jordan XIII "White/True Red/Black"
The &apos;Cats just worked the odds beating three number-one seeds on their way to a national title, spent the summer in Australia eating McDonald&apos;s and running foreign squads, and then came back in the fall returning all five starters and Jason Terry. If you wear the crown you have to hold it down. Miles Simon, who was last seen in Uptempo &apos;97s for the Final Four converted to a "Blank Panther" and ran with the king. The Jordan XIIIs were one of the craziest concept designs to date for the Jumpman team.